Water damage from slow roof leaks can lead to significant costs for repairs or roof replacement. 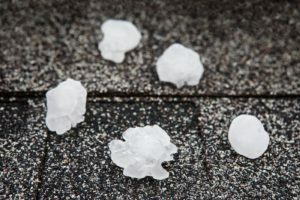 Especially at this time of year, when storms and heavy rains are pelting Kansas City, the chances of sustaining hail damage increase and even the smallest leak in the roof can cause water damage. It can be hard to imagine how a small drop of water can do any real harm to your roof, right? But when it’s thousands of water drops that fall during a storm with high winds and hail, it becomes something to be concerned about. When your roof has been damaged, water can easily penetrate all the porous roofing materials and result in severe structural damage and mold growth – long before you even become aware of the problem. Importantly, a leaky roof is not just a structural problem – which is serious in and of itself – but it also poses safety and health risks, as well. When your roof sustains water damage, the water slowly but steadily works down from the attic to the foundation, compromising the structural integrity of your home. It also creates a serious fire hazard from shorted electrical wiring and the possibility of mold growth, which can be a serious threat to your family’s health. Roof Damage can lead to water damage. Even with these telltale signs, locating the source of a leak can be difficult. As water travels along roofing panels and timber in the attic it drips onto the insulation and leaves visible evidence. If you can’t find the leak, have your roof professionally inspected. Having the roof inspected without delay after a strong storm can prevent slow but devastating water damage that can lead to costly roof repairs or replacement, mold remediation and other water damage restoration. Homeowners are strongly advised to hire a licensed roofing contractor for mold remediation, repair water damage and leak-proof your home. The experienced technicians at AAS Restoration and Roofing will inspect your entire property, assess the water damage, contain mold growth and remove the spores. AAS Restoration and Roofing has been serving Missouri and Kansas for more than 30 years. We have the capabilities to inspect for hail damage and water damage, repair and replace your roof and remediate mold. We are experienced in disaster relief and are commited to excellence. Homeowners can have peace of mind knowing their homes are in good hands with local, professional roofing services.